Traveling within Italy by trains has numerous benefits starting from super short overall travel times, great amenities and service onboard the modern trains, to high safety standards and stations’ location convenience. In this piece, you’ll have Italy trains explained from A to Z. The Italy train system and rail network is very well-developed with over 25 thousand kilometers (about 17 thousand miles) of rail tracks, meaning you can take trains across Italy and reach practically any destination on the country's continental part that you need. Trenitalia is the major Italy trains company which is responsible for operating both regular and high-speed trains. The high-speed Italian rail network connects cities like Rome, Florence, Naples, Bologna, Milan, and Venice (among many others) by modern Italy bullet trains. Italo Train (aka "Italo Treno") and Frecciarossa are among the best brands. How to use Italy trains? The Italy trains map may seem extensive as the country’s rail system is very broad, yet understanding Italy trains isn’t as tricky as it may seem at first. Mainly because train travel in Italy is a perfect way to not only enjoy great views of the countryside but to get a fast smart connection when compared to travel between the cities on large buses or even flights (keeping in mind the out-of-town locations of airports, extra time for check-ins, etc). So what’s for Italy trains advice, for starters, it is recommended to book Italy train tickets in advance to get ahold of good prices and availability. After doing so, make sure to read your e-ticket carefully to find out the departure time as well as which station you depart from (there may be more than 1 rail station in large cities). Provided the opportunity, print your ticket out or at least have access to it on your mobile device as you will be asked to show your ticket together with your passport (or ID) when boarding the Euro train. Finally, arrive to the station about 30-40 minutes prior to departure time as you’ll need to pass a security check similar to that in an airport at the station. Are Italy trains on time? Among other great things about touring Italy by train is that the trains, especially the high-speed ones, have a good rating of on-schedule departure and arrival times. However, there may be rare cases of delays. There exist some requirements regarding how much luggage each passenger can bring onboard an Italo or Frecciarossa train. As a rule, the Italy trains luggage allowance is 2 carry on suitcases per person. On the train there are special areas and luggage racks where you can leave your belongings for the time of your travel. Can you eat on Italy trains? Of course you can, moreover, it is allowed to bring your own food and drinks onboard the train, unlike during flights. Plus the train staff offers beverages and snacks for purchase from food carts and many of the trains are usually equipped with a bistro or restaurant car where you can buy some food as well. The Italy train schedule is very convenient and offers more than one departure time per day for most of the popular routes. As for the prices, this totally depends on the route, chosen travel class, departure time, traveler’s age, and whether it’s a last-minute booking or one done well beforehand. Do Italy trains have WiFi? 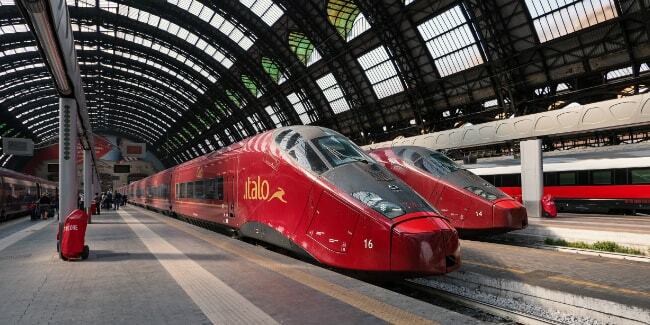 Yes, most Italy bullet trains, such as Italo and Frecciarossa, offer free WiFi for passengers. The connection is good and available throughout the ride.